This story starts a few days before I left for the family camp in the Adirondacks. I was planning on heading up there for the last few days of New York’s northern zone season as I have for several years now. For some reason I had this odd, strong feeling about November 28, 2012 being “The Day”. 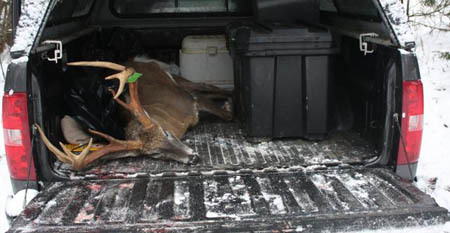 I told my Dad and my girlfriend Bonnie separately that if I was going to get a buck that this was going to be when. This day would be my late Granddad’s birthday and the 10th anniversary of my first buck kill. I was a senior in college that year and in addition to being Granddad’s birthday it was also Thanksgiving. My brother Owen and I pulled into my Grandparent’s driveway in our hunting clothes with a dead buck to show off when we should have already been there visiting with family and preparing to feast. Of course everyone wanted to see the deer and hear the story. As I replayed the events to a mixed audience of farmers and city dwelling cousins I was cut off by Granddad in midsentence after I said I had “harvested” the buck, a term I used in an attempt to soften the details for less tempered relatives. Granddad exclaimed, “You didn’t harvest him, you killed him and don’t say it any other way!” I didn’t know it at the time, but that would be Granddad’s last birthday. I’ll never forget that moment or that day. 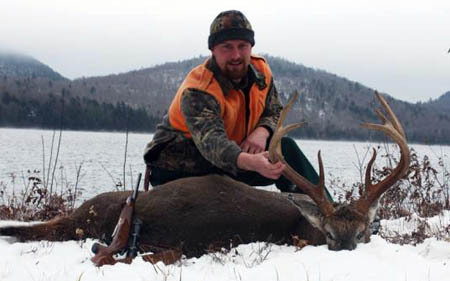 Hunting the rut in the Adirondacks would seem logical, but if there isn’t snow in those big woods it can be difficult to locate deer, which is why I prefer the end of the season when it is more probable that there would be tracking snow on the ground. This year the conditions were perfect - three inches of snow on the ground and light snow showers every day with temperatures staying slightly below freezing. I started out at daybreak on the first day by driving thirty or so miles around the park and on various logging roads in search of a large buck track crossing the road, a track I never found. I ended up back near the main camp area and headed off on the trail to Salmon Lake as there had been a fair amount of deer activity seen in that direction a week or so before. I cut some deer tracks three quarters of a mile down the trail and followed them in the general direction of North Pond. As the tracks appeared to belong to a couple does and fawns, I left them and followed the outlet to the Flowgrounds. From there I hunted up a hill off the north shore of the pond where I found a couple of snowed in scrapes and plenty of feeding activity. I soon spotted a doe and fawn towards the top of the hill but they had also spotted me and soon bounded away. I noticed the top of the hill appeared to be fairly open and looked like a potential buck bedding area. I was excited to find two big beds on an overlook; one was a day old with snow in it and the other was fresh with a nice-sized track which quickened my pulse. I followed the track down off the hill perpendicularly to the way I came up and noticed where the buck had fed on ferns, bedded very recently, and even saw where his antler tips stuck into the snow as he fed. Now I knew I was on a decent buck and the track was very fresh. As I followed the track, it then traveled in the general direction of where I had encountered the doe and fawn. Suddenly the buck had stopped and then bounded away and down the hill to the northwest. I had been close, but not close enough. Without snow I never would have known about him at all. How often does this happen when there isn’t any snow to tell the tale and the hunter never knows? Not having to ponder the answer to this question I took off on his trail. Just because I had jumped him didn’t mean that the jig was up. I followed him for 3 hours and several miles. I lost count of how many times I almost caught up with him and he ran again, but each time he would bound a little less before returning to a brisk walk. I was unsure whether he was physically tiring or he was starting to wonder what was really following him with nothing really bad happening… yet. Several times he crossed other deer tracks and even my own as he attempted to shake his pursuer, but with every step he left a telltale trail that this predator knew he was at the end of. At one point he stuck his nose deep in the snow where a doe had urinated; apparently the urge to breed was slightly stronger than the urge to survive. I wish I could say that at the end the day there laid a majestic buck in a picturesque setting unaware of the doom taking aim at his vitals, but at 4:30 pm I reluctantly left his track and beat feet from a point near the Salmon Lake Boathouse over the two miles of trail back to my truck. My GPS read 8.6 miles for the day’s wandering. Throughout the pursuit I innately knew it wasn’t going to happen that day and for some reason tomorrow, the 28th of November was The Day. The second day dawned with high hopes and optimism. Conditions were again great with another light dusting of snow that continued through late morning and I of course had that feeling. Because I had been on what seemed to be a pretty nice buck the day before I decided to get right back on his track and see if I could finish what I had started. I picked up where I left off and soon lost his track after he got into a group of does and fawns feeding. With a dusting of snow over everything it was impossible to figure out which tracks were his. As I write this I am kicking myself for not making wide circles around the top of the hill and the feeding activity to find where he had walked out, but then I would have a different story to tell. One of the caretakers had suggested checking out the Fly Ponds area as he had seen a lot of deer activity in that general vicinity the previous year at the same point in the season. This seemed like a good idea and because I had never been there before that’s where I headed. The last major bit of deer sign I saw was right by the road where I parked even though I went to the Fly Ponds, headed west towards Salmon Lake, got tangled up in a nasty blow down area, looped back towards the low area between Pilgrim Pond Mountain and East Pond Mountain, crossed beaver dams, and closed my eyes and rammed through dense spruce thickets. Sure I saw a few tracks from does and fawns, but no major feeding activity, and more importantly, no big buck tracks that begged me to follow. I’ll admit, at 3:30 pm, when I was on the back side of East Pond Mountain and I hadn’t seen any deer tracks in the last couple of miles my inner “feeling” began to waver. I noticed a marker nailed to a tree indicating a trail that a cousin had cut over the peak of the mountain and down to the main trail that led to my truck on the other side. I had heard about this mountain trail, but never actually been on it. Because it was a shorter route back to the main trail although steeper, I decided to give it a try. That was a mistake, but looking back, every step I took that day played a very important role in my timing. As I chugged up the mountainside I felt as though I had wasted a great day of ideal tracking conditions without actually following a track. There was always tomorrow, but what happened to today being The Day? About two thirds of the way up there were suddenly three does standing in an opening above me at about 40 yards. I raised my gun and searched desperately for a buck that wasn’t there. They ultimately spooked, taking a fourth, previously unseen doe with them. Exciting, but not what I was looking for. As I caught my breath at the top and peered over the edge at the rest of the trail disappearing below me I questioned my decision to go over the top instead of around but it was too late to turn back. Were there any deer tracks on that side of the mountain? I have no idea. I spent more time slipping, sliding, and getting grabbed by snags while trying to survive my ride to the bottom than I care to endure again. I can’t tell you what the purpose of that trail is but I know it’s not for hunting. At least now I was on fairly level ground and I could ease my way back towards the truck. Although the day was almost over I do remember thinking it wasn’t quite over yet and because I had long ago been taught to be attentive and looking for deer as long as I could still legally hunt, I carefully eased my way along the shoulder of the mountain in the direction of my truck. What I saw when I reached had me struggling to think clearly; the antlers on this deer were absolutely gargantuan. The mass is indescribable. I admit I have not been known to be a spiritual person, but I immediately looked up at the tree tops and sky above and said, “Thank you Granddad.” After that I can’t remember what I babbled but I know I stomped around that deer just looking at the obscenely thick antlers in disbelief. I looked at my GPS, it was 4:22 pm, and I’d covered 11.1 miles at that point. For such a magnificent buck to cross paths with me at nearly the last legal minute, on Granddad’s birthday, exactly ten years to the day after I’d killed my first buck, and on a day that I somehow knew several days in advance was "The Day" is eerie. Coincidence? Anyone who knows me knows that I am more than a little superstitious when it comes to hunting. For example; I shaved off my big buck beard as soon as I got home (can’t shave from the beginning of the season until you get a buck or the season ends- I am not the only hunter that believes in this, and it may seem silly but you won’t convince me otherwise). For me to tell my Dad and girlfriend ahead of time about “The Day” was way out of character because it would ensure failure and I would jinx myself. The following morning I took a lot of pictures trying to capture the sheer massiveness of the buck. I have realized that a person really needs to try to wrap their fingers around the beams to appreciate how much bone there is. 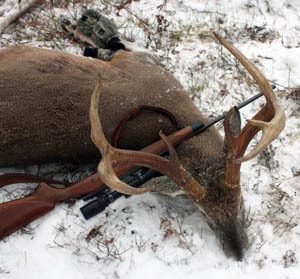 With bases of nearly 6” and H2s over 5”, the thickness of the antlers actually make the whole rack look smaller than it is when seen from a distance or in a photo. For example: I assumed the main beams were around 22” and the inside spread was about 16”, but was shocked to tape the inside spread at 18” and both main beams at 26”. What I assumed was a really heavy 135” 8 point turned out to be a high 140s (I rough scored it at 149) 8-point, which is remarkable considering G3s that are only 3" and 4”. Luck is the number one ingredient in deer hunting and I am extremely fortunate to have as much of it as I’ve had, but on November 28, 2012, not only did I have a lot of luck, I had Granddad. 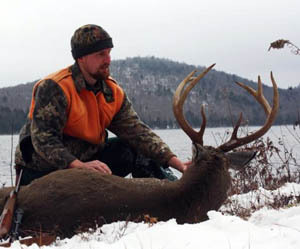 Sam's huge 8-point weighed in at 180 lbs.